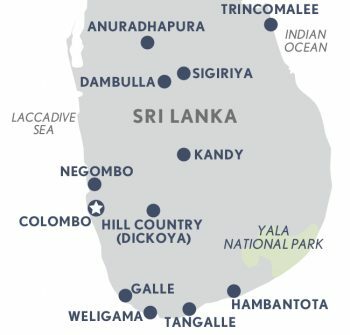 Though compact, Sri Lanka packs a punch with World Heritage sites, hill stations, golden beaches and national parks plus beautiful boutique hotels. Sri Lanka is a dreamy, tropical destination with a landscape of upland tea plantations, jungles, and a coastline of palm-fringed beaches. Formerly known as Ceylon and Serendib, Sri Lankan culture is shaped by Buddhist philosophy and infused with Portuguese, Dutch, and English flavours. Our team of Abercrombie & Kent travel experts go the distance to ensure your luxury tour of Sri Lanka is a VIP experience from the moment you arrive in this colourful, enthralling country to the moment you board your flight home. You’ll stay in hand-picked accommodations with amenities as exquisite as the view from your bedroom window. Guests enjoy one-of-a-kind experiences and activities that show off Sri Lanka’s captivating customs and scenic vistas. Sample some of Sri Lanka’s staple foods, from flavourful curries to savoury kottus and hoppers. Wander the ancient palace ruins at the medieval capital of Polonnaruwa, breathe in the smell of fresh flowers at Kandy’s Royal Botanical Gardens, and sink your toes in the sand at Mawella beach. With its mist-coated mountains, rolling hillside, and sandy beaches, Sri Lanka truly is a country with something for everyone. Whether you travel to immerse yourself in new cultures, learn more about a country’s history, or you’re simply looking for a sublime space to rest and relax, our luxury tours are fully customisable to deliver precisely the Sri Lankan experience you’ve been dreaming of. Begin your journey in Colombo, the oceanside capital whose colonial buildings, stylish eateries, and charming boutiques set the tone for what’s to come. We’ll guide you through the Gangaramaya Buddhist Temple before whisking you off to Sri Lanka’s Cultural Triangle, where you’ll visit the world’s largest stupa, the clifftop citadel of Sigiriya, and enjoy the opportunity to hike, bike, and wander through sites rich with history. To avoid long drives, guests also have the option to experience the country’s most important scenic and cultural attractions by air. We carefully select luxury accommodations that meet our exacting standards of comfort and safety, and that are ideally situated for adventure and relaxation. Ceylon Tea Trails is the world’s first tea bungalow resort; located in Hatton, the award-winning resort borders the World Heritage Central Highlands. You will stay in a beautifully restored tea planter residence and be treated to gourmet cuisine and panoramic mountain views. After a day spent photographing wildlife on your 4WD safari through Yala National Park, continue your outdoor adventure and retire to your fully customised, air-conditioned tent. We are proud to partner with Kulu Safaris, whose goal is to offer guests an exhilarating, environmentally conscious camping experience. Many travellers choose to book a holiday between December and March, when the humidity is lower with temperatures more comfortable for sightseeing and exploration in Sri Lanka’s hill country and along the south coast. However, those willing to brave monsoon season (May through September) will be treated to a unique experience, as the countryside is saturated with lush greens. Surprises galore in this beguiling island nation. Peel back the layers and you’ll discover a deeply spiritual place where Buddhist values motivate daily life and a rich cultural heritage is interwoven with colonial influences. Despite its small size, Sri Lanka has fascinating ruins, mist-covered mountains and enthralling customs. On this journey, you visit five World Heritage listed sites as well the palm-lined south coast, the oceanfront capital and the tea country. This dreamy, tropical island nation others visitors a beguiling blend of World Heritage sites, Buddhist philosophy, lush tea estates and flavourful food. ​Set on the unexplored east coast of Sri Lanka is Jungle Beach, a unique and beautiful setting for total relaxation. Nestled between the sea and dunes is Uga Chena Huts a boutique style lodge offering a unique experience in this wildlife haven. The "huts" are luxury pavilions, modern in design and positioned perfectly for privacy.